It is a beautiful day so I decide let’s visit Jack. Earlier I had learned through a presentation at the morning Rotary the best alignment for solar is about 165 degrees magnetic. I wanted to check it out. I put Bear and Sidney in the Jeep and we headed North. I pulled into the camp area and oriented the future building on the ground. The canopy could sit just right, facing south west and next to a big beautiful cedar tree. I checked beyond the camp and saw that the oak, that looked so dead a few weeks ago, was erupting into leaves. Sidney was just beyond the oak. He is normally pretty good, but not so at Jack. 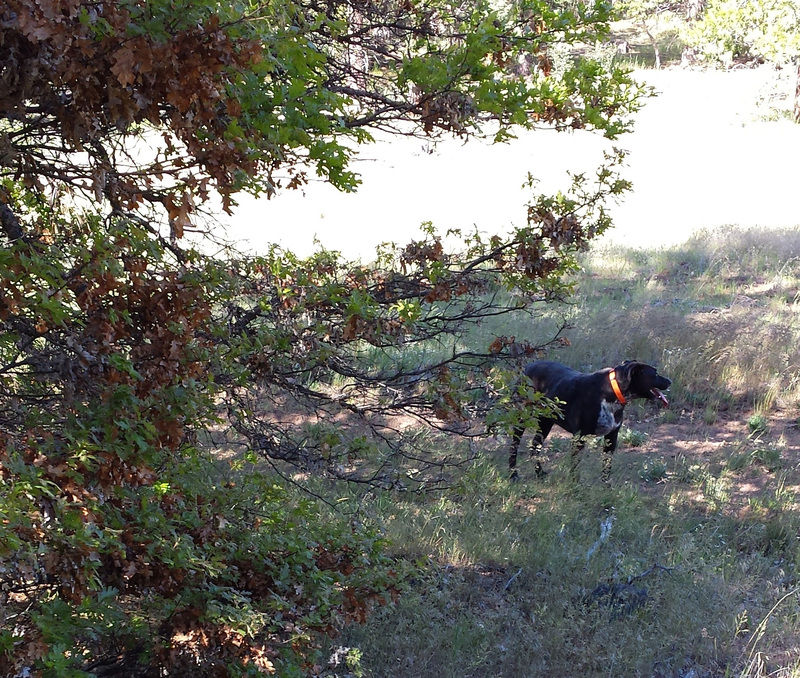 He must love the place for once he is let out of the Jeep he cannot easily be retrieved. I blow my whistle and then call him by name. He often returns, but keeps his distance. When I ask him to enter the Jeep, he turns his back and ignores me. This is different. Normally we have very collaborative discussions. The only thing that works is to drive away and he will trail behind apparently not wanting to be abandoned. He is reluctant to be caught and when the gate at the rear of the Jeep is opened, he falls to the ground a limp body demonstrating his civil disobedience to leaving Jack. 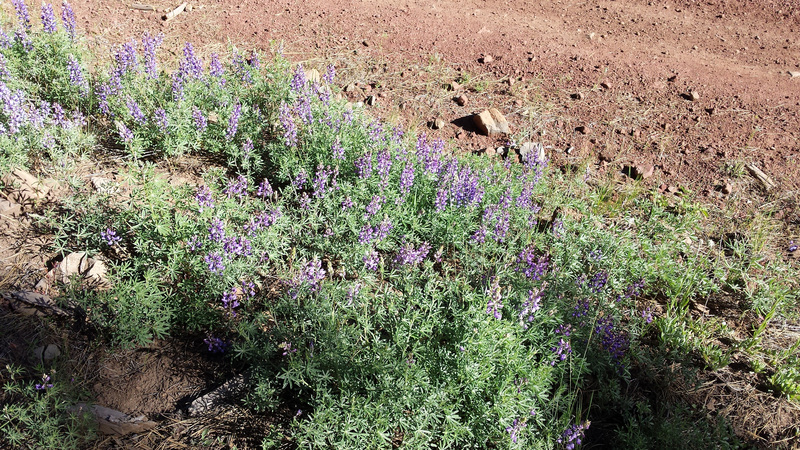 Heading home along the road I come across a beautiful field of lupin. They reminded me of the Southern Sierra’s and the Diablos in Central California. This is a beautiful season in the Cascades and a portion of the flora and fauna are similar to my sweet memories from the southern mountains. A short distance further down the road blocking my path is a snake. Is it a rattler? If so, it would be the first I have seen in Oregon. No it isn’t. 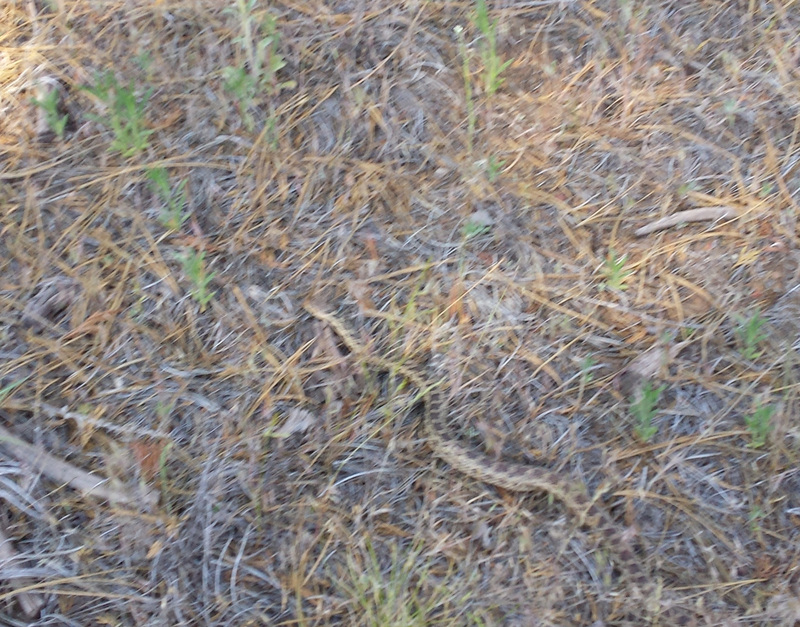 Is it a Gopher Snake, or a Garter Snake, A Pine, or a Water snake? You may know. Another half a mile passes and I have a choice. 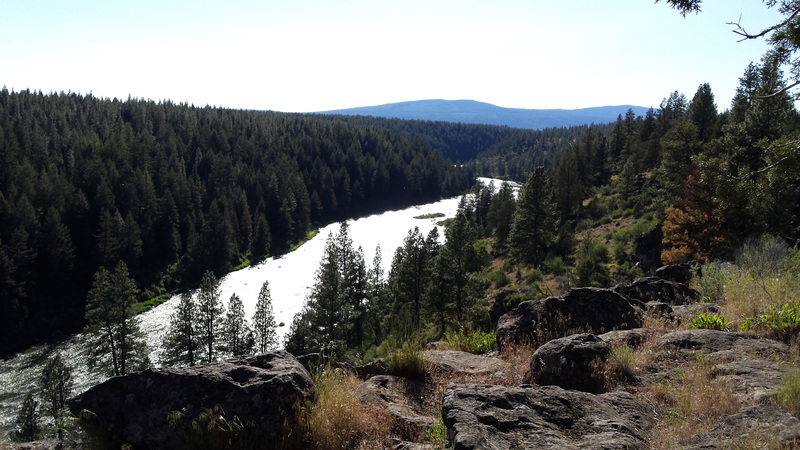 I can return to Camp Day and home, or visit the Klamath River Gorge. It is a short distance and is a stunning view as the river flows west towards the Pacific. Theresa and I had tried to visit earlier, but our path was blocked by large, scary mud holes. There is no such problem now. The river, I am told, is good trout fishing. The only problem is that the season ends in the middle of June. I won’t be able to try it this year. 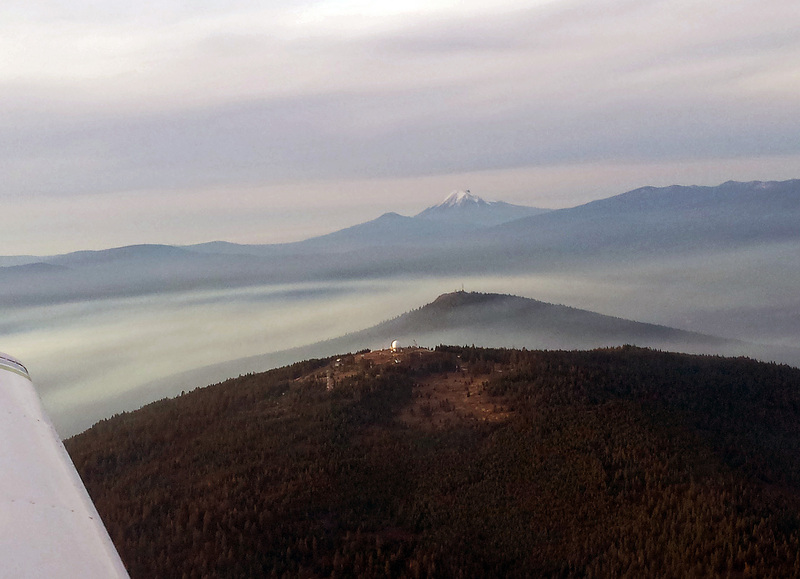 It took just a few minutes to return home from the Klamath River. 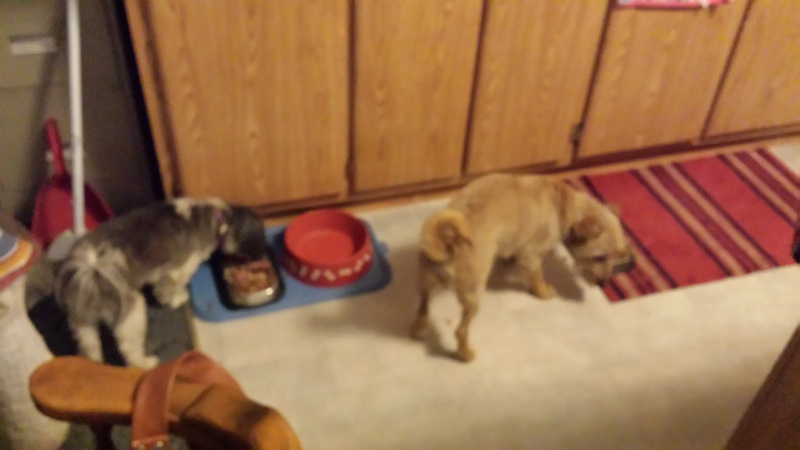 It is meal time and the dogs are eager to eat. There has recently been a problem with Bear eating. That was not the case this evening. We added some graded cheese and Bear with Bella nearby dug in. All in all, it was a beautiful day and an excellent visit to Jack. Hopefully one of the first of many, many to come. Jack, a warm spring day, happy dogs are great — family would make it perfect.